Joe Lunievicz was one of the authors I met at the Book Blogger Convention on Friday. The cover of his book piqued my interest. Swords, a New York skyline. “What’s your book about?” I asked. I’m not sure those were his exact words, because what I heard was: I NEED TO READ THIS! I loved reading this book as much as I knew I was going to. Cedric Wyman, Cid, to his friends, is growing up in Queens, living a pretty grim existence. Ducking his father’s fists, and trying to stay on the good side of a severe disciplinarian grandmother. But then he discovers his grandmother’s secret- she goes to the movies, when he thinks she’s going to church. And there, Cid is first swept away by swords and swashbuckling on the silver screen. After his family falls apart, the movies help him hang on… until his World War I veteran cousin comes to his rescue. Cid’s cousin “Lefty” teaches him fencing history, stage combat, and introduces him to Vavarinski, a mostly drunk, wholly eccentric fencing master. Stage combat and fencing give Cid his place in New York, and an excellent coming of age tale. I knew I couldn’t help liking this, because it has so many elements that appeal to me- New York history, fencing, stage combat, eccentric but goodhearted characters. More than that, though, what I appreciate is that the storytelling stays straightforward. It would be easy to tilt over into flights of fanciful poetry, in terms of language or plot. What Lunievicz does is stand back and let the story breathe, lets emotions and reactions evolve naturally. For the characters, and the reader. Cid and his friends are scrappy, sometimes prickly with each other, wary and toughened by experience. Lefty and the fencing master carry their own scars and mistakes, without being overblown tragic heroes, or overt father figures. There’s a subtlety to the craft of the writing, that I appreciate. The prose gets out of the characters’ way. I know so many specific people in my circle of friends who will love this. (Hi, Gomez!) But more than that- pick this up, if you love movies, or swords, or excellent historical fiction. Thank you for the thoughtful and kind words about Open Wounds. I’m so glad you liked it! I was fortunate enough to be able to read this one even before the Advance Copies came out… and it’s saying something that I have never been able to read anything much longer than a polite email on a computer screen, but I totally LOVE this book. 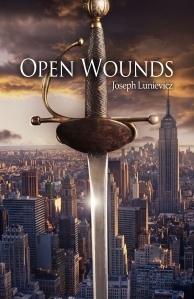 OPEN WOUNDS really has all the elements of the kinds of books that excited me about reading when I was young… but, at the same time, it’s the kind of book I look forward to seeing published as an adult. People need to read this book. Brilliantly done… Something Mr. Lunievicz should be very proud to have given us. I had to stop reading this post part way through, because I’m in the middle of Open Wounds and loving it too much to allow anything to get spoiled. But otherwise, great review. Joe’s the best!